A newcomer to Kansas City’s Crossroads is not only bringing more tech jobs to town – it’s showing a glimpse into what offices of the future could look like. Valorem’s Crossroads Office rocks gigabit teleconferencing. Valorem Consulting Group LLC is an IT consulting firm that focuses on Microsoft products and cloud-based services. Founded just six years ago by area natives Domnick Parretta and Justin Jackson (of KC and St. Louis, respectively) the company has grown extremely fast – and shows no signs of slowing. “We put everyone in recruit mode, which reaches way out past our walls here,” says Allison Jensen, Valorem marketing director, over the phone from the company’s Crossroads office. And while attracting and retaining tech talent to the KC region is a huge priority at KC Digital Drive, we also applaud Valorem’s excellent taste in totally rad intra-office technology. Jensen and her associate, Sarah Beasley, speak rapturously of Valorem’s state-of-the-art conferencing tech. 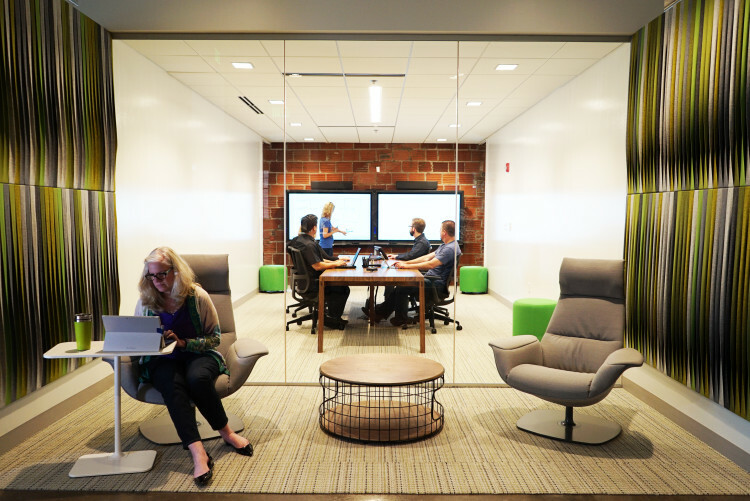 Enabled by symmetric gigabit from Google Fiber, Valorem’s Skype for Business setup combines videoconferencing and screensharing, creating what Beasley calls a “social environment” between workers or clients who are in the office and those who are remoting in. One of the killer apps of the gigabit age is the lifelike presence that tools like large-scale Skype afford. In turning ear-straining conference calls into interactive human experiences, such systems change the way people work and collaborate across distance. For a company growing as ambitiously as Valorem, that’s huge. Learn about all the speakers from Compute Midwest — and check out their at-bat anthems.